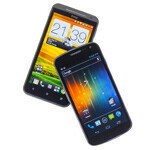 Since the launch of the HTC Nexus One the Nexus line is what all Android phones have been measured against. The flagship Nexus represents Android in its purist form: the latest software directly from Google. Currently that flagship device is the Galaxy Nexus, the launch device for Android 4.0 Ice Cream Sandwich that hit Verizon’s shelves and LTE network in November. With an impending launch of their own LTE network Sprint has brought the latest Nexus to their lineup as well, but will the flagship Android device be the flagship phone for the pin dropping network? Not if HTC has anything to say about it with the latest member of the EVO family, the EVO 4G LTE. Read on to see how these competing devices compare.